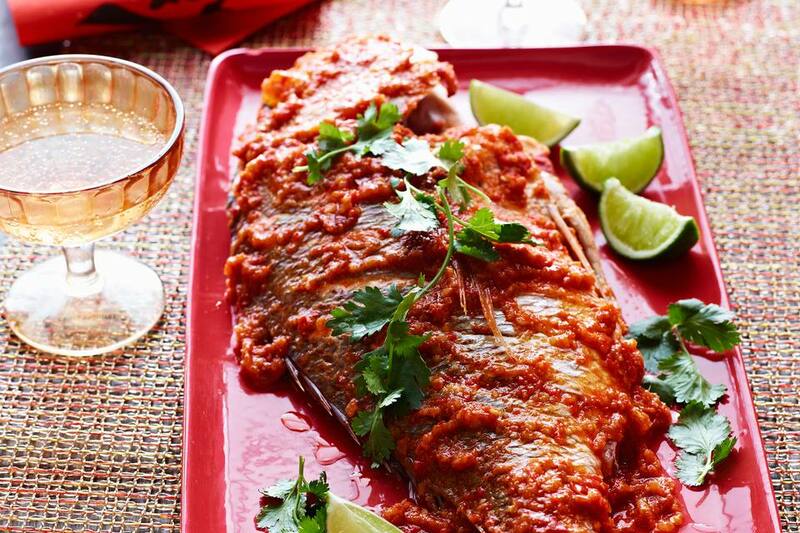 A great traditional Malay dish that is easy to prepare: perfectly fried whole fish with crisp skin and moist flesh smothered with sambal sauce. To get the fried fish to that perfect stage, however, two things are required: seasoning the fish and frying it correctly. For the seasonings, the fish is rubbed with salt and turmeric powder. To fry the fish, use enough oil to make sure that at least half of the fish is submerged. Make sure too that the oil is extremely hot before lowering the fish into it. The spicy sauce, or sambal in Malay, is excellent not just with fish but also with other seafood, meats and even hard boiled eggs. Make a whole tub and freeze extra portions for later use – then get the neighborhood talking when you serve this exotic dish at your next dinner party. This dish is perfect with newly cooked rice. Rinse the fish well. If the fishmonger hasn't cleaned it for you, remove the scales, guts, and gills. Score the flesh by making two to three slashes on both sides, the depth of the slashes midway between the skin and the flesh. Mix the salt and turmeric powder. Rub the mixture all over the fish including the cavity. Cover with cling film and leave to marinate in the fridge for half an hour. About ten minutes before cooking, take the fish out of the fridge to allow it to come to room temperature. Heat the oil in a wok/pan until it is very hot. Keep the flame on high heat. When the oil starts to smoke, it is time to put the fish in. Very hot oil helps keep the skin and flesh together and prevents the skin from sticking to the wok/pan. Be very gentle when you place the fish in the hot oil as moisture from the fish may cause the oil to bubble and splatter. A pair of long tongs / spatula will help you keep a safe distance. After about half a minute, turn the heat down to medium. If there is sufficient oil so that all of the fish is completely immersed, then there will be no need to turn the fish over. Otherwise, turn it over after about two minutes. Fry until both sides of the fish are golden brown. Place some kitchen towels on a plate. Put the fish on top of the kitchen towel to drain away excess oil. Transfer the fish to a serving plate and smother with sambal sauce. Serve at once.